Jeremy Hunt has allowed the Department of Health to be hijacked by the big pharmaceutical companies. They are a trillion pound industry, and usually make expensive drugs that kill, or are ineffective. They get Hunt’s departments to deny people inexpensive treatments that work, and kill 200,000 British people a year. Big Pharma directors or representatives sit on all the health bodies Hunt is responsible for: The Department of Health, the NHS, the MHRA, NICE, the GMC…..
Jeremy Hunt’s entire ministry is corrupt. 70 MP’s have received “donations” or patronage from big pharma, including Philip Hammond the new Chancellor, David Davis, Michael Fallon Liam Fox and David Cameron. 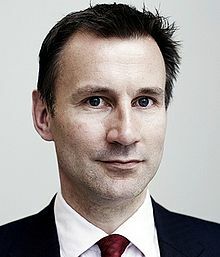 Jeremy Hunt himself received £32,920 from a hedge fund that invests in healthcare firms. And it doesn’t help that Theresa May thinks British big pharma companies are wonderful. As a result big pharma gets away with rampant overcharging for appalling drugs, many with awful side effects, that don’t work, or barely work. For example, big pharma put up the price of the anti epilepsy drug phenytoin sodium, 22 times over; its prescribed to 50,000 people. NHS spending on it went from £2.3 million to over £50 million in just one year. And this is normal; it happens continually in the NHS. Sir Richard Thompson, former president of the Royal College of Physicians, and personal doctor to the Queen, has called for an urgent public inquiry into drugs firms ‘murky’ practices. He and 5 other eminent doctors warn about the influence of pharmaceutical companies on the prescription of drugs. They state that too often patients are given useless, and sometimes harmful, drugs that they do not need, and the side effects of too much medicine is leading to countless deaths. They maintain drugs companies are developing medicines they can profit from, rather than those which are likely to be the most beneficial. And they accuse the NHS of failing to stand up to the pharmaceutical giants. Reservatrol, eg Longevinex, is far more effective than statins at protecting from heart disease. But it has three problems: Its natural, has no side effects, and is inexpensive at just 80p a day. The MHRA, which is supposed to protect British people, actually protects the profits of the big pharmaceutical companies. It closes down British companies than make new, inexpensive treatments that work, because they are a threat to big pharma profits. Needless to say, the MHRA have big pharma directors on their board, and kill an estimated 100,000 British a year as a result. See www.mhracorrupt.st. The GMC, General Medical Council, strikes off doctors who use natural treatments instead of drugs. The most famous being Dr Andrew Wakefield, who proved that the MMR vaccine causes autism. There are hundreds of thousands of cases around the world of MMR causing autism, but it makes billions for the pharmaceutical companies, so the GMC and all Jeremy Hunt’s departments flatly refuse to admit it. 160,000 cancer patients die every year in the UK. There are a dozen, inexpensive treatments that work with no side effects. But Jeremy Hunt’s departments drive those patients in to the poison of chemotherapy, which maims and kills. Why? Because it costs an average of £40,000 a round. That’s profits at the scores of billions of dollars level for Big Pharma. Half of cancer patients die from the chemotherapy, not the cancer. According to the Journal of Clinical Oncology, who studied 15,000 cancer cases, chemotherapy fails, or is useless, 97.7% of the time over 5 years. Essaic herbs, antineoplastos, salvesterols, GcMAF, a human protein, an alkaline diet without sugar or carbohydrates and vitamin B 17 or laterile, have over 10,000 successes and the Ministry of Health refuses to look at them, and closes them down where it can. Even Cancer Research UK rubbishes inexpensive treatments, and drives cancer patients into the poison of chemotherapy. Yes, they have Big Pharma on their board too. It seems Cancer Research UK kills scores of thousands of people who trust them, every year. It appears Jeremy Hunt is responsible, over 3 years in office, for 600,000 unnecessary deaths. That’s the worst record of any government minister. The entire UK medical/pharmaceutical industry is corrupt. Jeremy Hunt should either throw big pharma control out of all our health departments, or resign. Go to the Pharma Death clock – http://pharmadeathclock.com/ – Since the year 2,000, Big Pharma’s war on humanity has killed more people than the 11 million killed in the world’s half dozen wars.